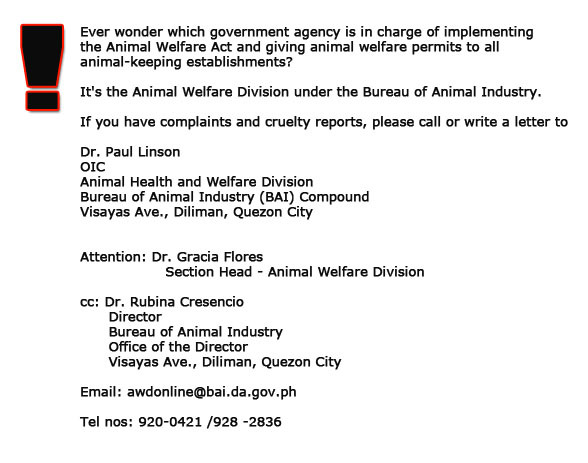 Reports about pet shops should be directed to BAI-AWD (Bureau of Animal Industry - Animal Welfare Division) at tel. # 928-2837 or 924-7951. Pet shops are under the bureau's jurisdiction. BAI is responsible for issuing certificates of registration to pet shops yearly if said establishment is adequate, clean, safe and sanitary and will not be used for nor cause pain and/or suffering to the animals - as mentioned in RA8485 The Animal Welfare Act. BAI can revoke or cancel the certificate of registration if the establishment fails to observe these conditions. Aside from the description of the situation/circumstances witnessed at the pet shop, please make sure to provide the business name of the pet shop, the address, and if possible, the owner's name. Photos would also help if you have them. Please copy furnish PAWS through philpaws@paws.org.ph when you submit your complaint to BAI. Please help us spread the word not to buy pets from pet shops. And if possible, buy pet supplies from shops that do not sell live animals. First and foremost, make the effort to talk to the staff and/or owner of the pet shop to see if friendly discussions alone can already help improve the situation of the animals in the pet shop. witness affidavit (click here for a sample) - The witness affidavit is a document with the details of the cruelty or neglect as seen personally by the informant (include dates, time of day, location, what you saw, what petshop/breeder did in response to your observations, etc.). We need this in our possession prior to deployment because this is a supporting document in case we have to coordinate with the police to seize the pet and file charges. The police will not likely respond to animal welfare concerns unless we have a ready legal supporting document to present. The identity of the informant/concerned citizen/witness is not disclosed during the initial stage of the investigation (warning letter and/or ocular inspection). The affidavit is also just kept on file and not disclosed or shown to the animal offender. If pet shop owner and staff willingly takes the steps necessary to improve the living conditions and care of the animals upon receiving warning letter, affidavit if not used and charges will not be filed. The affidavit of the informant/concerned citizen/witness is only used when pet shop owner denies the neglect or cruelty and challenges PAWS to file charges upon receiving the warning letter. PAWS does not issue empty threats about filing charges - thus, it is important that the informant is a willing witness and will not back out of the case. If pet shop owner calls on PAWS to file charges, PAWS will not hesitate to file charges with the cooperation of willing witnesses and their affidavits.